This archival box set includes 7 CD's, plus 2 bonus CD's, and a 96-page companion booklet of liner notes featuring song translations, cultural context and archival photos. These digitized archival recordings date back to the early 1900's, and were originally recorded on primitive wax cylinders, reel-to-reel tape, and LP's. 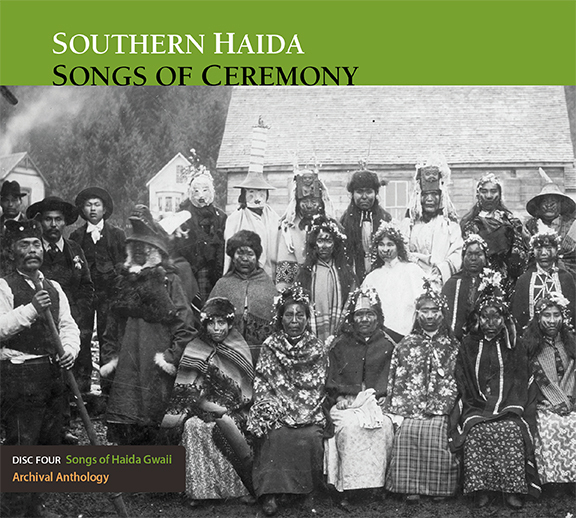 The anthology contains all locatable songs from Haida Gwaii, with as many variations or recordings by different singers.An ambitious project whose scale and quality is a first for First Nation's people in Canada, these recordings have been painstakingly restored. The CD's contain 213 songs and 322 recordings of previous generations of singers, brought together for the first time in our history. These recordings have been digitized to improve sound quality. Ceremony celebrates the transition from one stage in life to another. This CD includes 30 recordings of traditional ceremonial songs, from preparing to enter the potlatch and feast hall, to prayer songs. It also includes spirit songs, peace and headdress songs, and mourning songs. These songs inspire elders who can barely walk to dance with youthful grace and rhythm once again. To honour is the highest form of acknowledgement for one's contribution to the betterment of society. This CD contains 77 recordings of honour songs, love songs, children's songs, fun songs, gambling songs, songs of transition, war songs, and other songs. Songs of ceremony brings us together, of one mind, so that collective transformation may occur. This CD includes 41 recordings of traditional ceremonial songs, from the canoe to the potlatch; canoe songs, dinner songs, entering the potlatch and feast hall, peace and headdress songs, other ceremonial songs, and mourning songs. Feel the love for these songs and dances in the elders' voices, and be inspired to sing and dance with them. 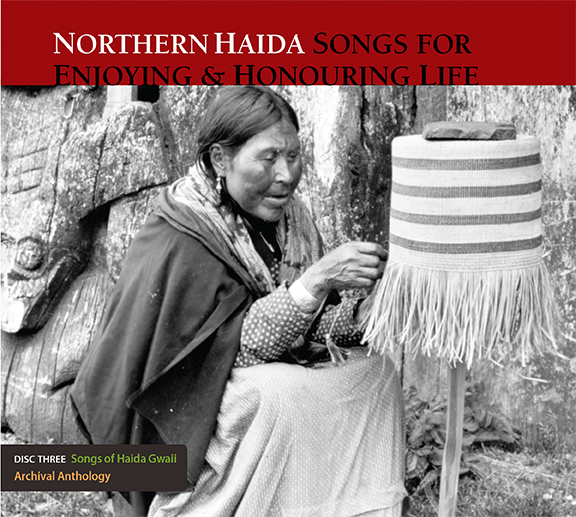 This CD includes 2 discs that together provide 65 recordings of all genres of Haida dancing songs, fun songs and other songs. Songs complete our lives, highlighting the beauty of new life, expressing love, easing sorrow, and honouring others and our connection with life. This CD includes 2 discs that together provide 88 recordings of love songs and songs of transitions. Our ancestors shared these songs with other nations to mark events and became a lasting symbol of peaceful relations. Hawaa | Haw’aa for keeping these songs alive and for sharing them with Haida Gwaii again. This CD includes 19 recordings of Haida songs survived with the Kwakwaka'wakw, Nuu-chah-nulth, Heiltsuk and Coast Salish, spanning various song genres. 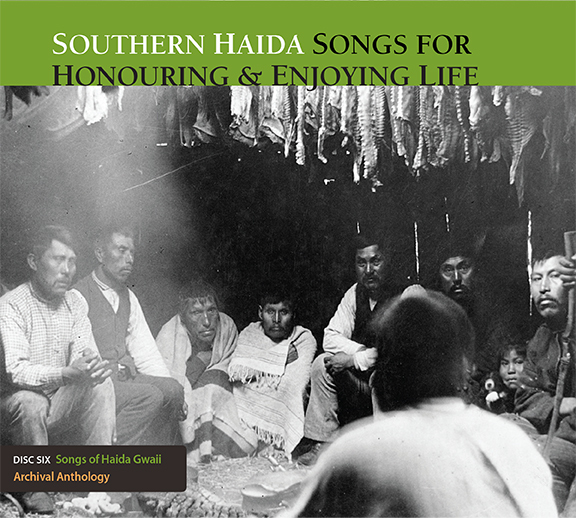 The 100-page companion book assist you with fully understanding and appreciating Haida songs. 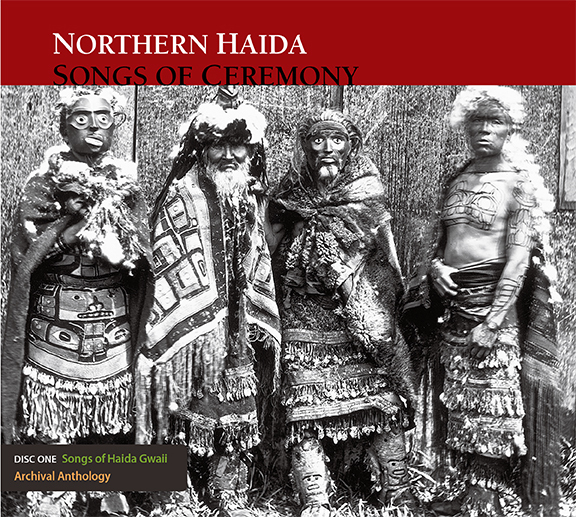 It features a comprehensive description of all genres of Haida musical traditions, as well as introductions and translations for all songs on the 9 Archival CD's. Throughout the book are evocative archival photos that celebrate the elders and the ceremonial art inspired by these songs and the beauty of Haida Gwaii.